Shooting mechanism from my T29 heavy tank’s model, with free instructions available. This mechanism, which was the key feature of my T29 heavy tank model, was taken from my another creation all the way back from 2008. The instructions include complete shooting unit with motor included and basis for the barrel which can be extended to desired length. Note that there is a transverse axle at the base of the shooting unit which can be used for elevating/depressing it. The mechanism relies on compressing and releasing a long hard shock absorber, which then fires 3L axles with stop from a single beam acting as an ammo clip. The beam is operated by gravity, moving 1 stud lower each time the shock absorber is pulled back, and its length is technically unlimited – the only thing limiting it in my T29 model was the amount of room under the turret needed for the emptied “ammo clip”. the mechanism can be potentially harmful for the motor that drives it. I managed to damage a PF M motor driving a yellow (hardest) shock absorber in my T29 after operating it for a while. PF L motor should be better suited to operate the mechanism. It is not recommended to use this mechanism with PF M motor. Free building instructions for the mechanism are available in the Downloads section. No, you can build it yourself. Can i buy one of the cannons from you? I’m using LPub and MLCad. what software do you use to make instructions? 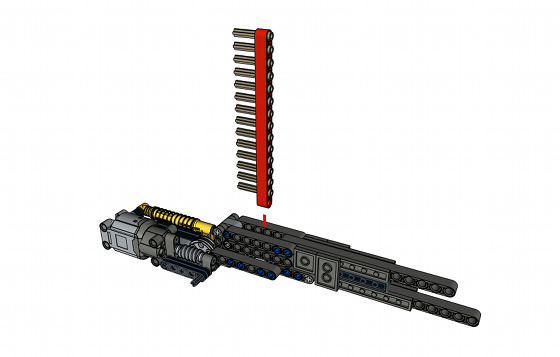 1.- I’ve built a LEGO “Double Clutch Transmission” (“DCT”), but it still needs a “Gear Selecting Mechanism” and a system to control the clutches. A “Double Clutch Transmission” (“DCT”) is a transmission that houses pararel gearboxes, one with the “Odd Numbered Gears” and other one with the”Even Numbered Gears”, each one with its own clutches with a common output. It pre-selects the next gear in the other gearbox according to “Engine Speed” and “Overall Speed” and when the next speed is selected it just switches clutches. If you”re interested just write me to my “E-mail” to send you a photo of it. Yes, you can 3D-print driving rings. 1.- Would it be possible to make a transmission with various size driving rings by “3D Printing” like cars’ and motorbikes’? Just a small warning. The stress that this shooting mechanism puts on the motor and gears is pretty high. Also, engaging the motor in the wrong direction is likely to damage either motor or gears. So be careful.